CHIVHU- Catholic Sister Christiana Mugocha (76) of the Nharira Parish in Chivhu Deanery is retiring after serving as a nun for 60 years. Sister Christiana, of the Little Children of the Blessed Lady (LCBL) congregation, was stationed at St Francis of Assisi Convent at the time of her retirement. She is retiring to the Chichester Convent in Chishawasha, a residence of old-aged LCBL nuns. Having devoted herself to celibacy for the past 60 years, Sister Christiana said she cherishes decades of hard work, perseverance and accomplishments in serving God. “I am going to the Chichester Convent but I will continue serving God there. I have no regrets because I feel I have accomplished what I was destined to do as God’s servant. But all the same, I will continue to abide by my vows of obedience, poverty and chastity,” she said. She said she is excited to be meeting sisters she trained sisterhood together with who are already residing at the Chichester Convent. Sister Christiana was born in 1943 at St Killian Mission in Mutare in a family of six. 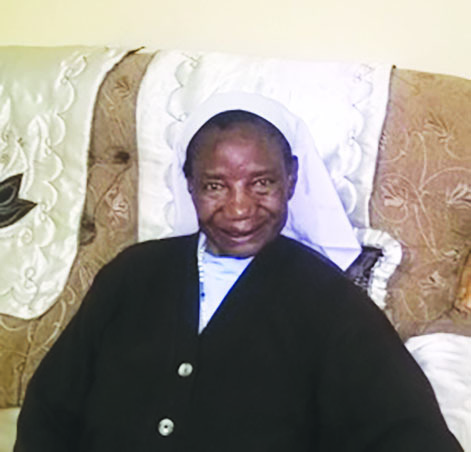 Her parents were famous devoted Catholics in the Mutasa Deanery, hence they easily approved her decision to serve God as a nun. She attended primary at St Killian before going to All Souls Mission in Mutoko in 1959 for her candidature in sisterhood. After the final profession of her vows at Regina Mundi Convent in Harare, she went to Johannesburg, South Africa, for a pastoral course and came back offering spiritual guidance to Catholic congregants at various parishes. This landed her at Gandachibvuva Mission in the early 1970s. Sister Christiana later served in various Parishes throughout the Archdiocese of Harare before she came to St Francis of Assisi Mission, where she served for three years before her retirement. Sister in Charge at St Francis of Assisi Mission Convent Sister Angella Madzivadondo said throughout her vocational life, Sister Christiana had been spiritually inspirational to other nuns and congregants. “She inspired many through her vigilance in pastoral work. She was ready to impart knowledge and spiritual guidance to other sisters and congregants. With her motherly-figure, she was never hesitant to reprimand,” said Sister Angella. The LCBL congregation was founded in 1923 by the late Harare Archbishop Ignatius Chichester, a Jesuit. The Chichester Convent, a residence of retired nuns, was named after him.